What started back in Anderson has continued at the Indiana Farm Bureau Football Center. The 11-year veteran Cory Redding helping Daniel Adongo learn the game of football in every facet. 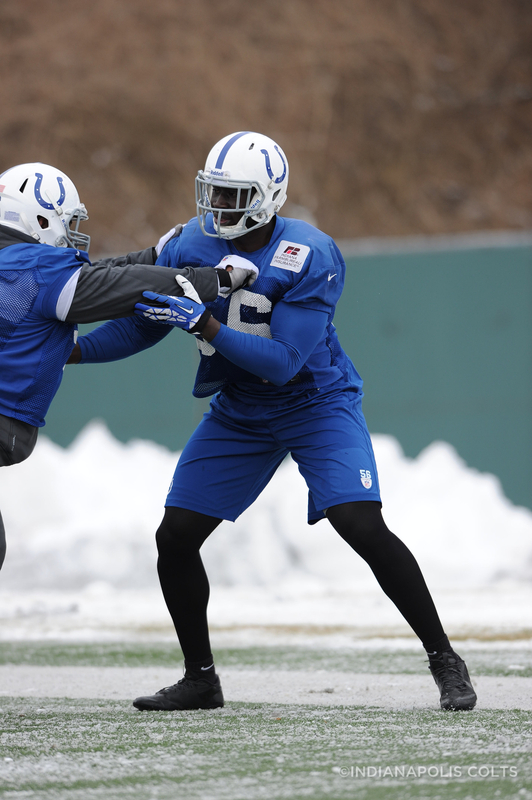 “He’s like a baby to the game,” Redding said of the newest member to the Colts active roster. That transition will come on Sunday afternoon as Chuck Pagano expects the 6’5”, 270-pound Adongo to play special teams for the Colts. Adongo thanks veterans like Redding and Robert Mathis for their guidance since he arrived to training camp in late July. Redding is beyond amazed at the progression Adongo has made on a field that was completing foreign to him just four months ago. When talking about his own development, Adongo uses the phrase ‘It takes a village to raise a child’ to describe the tutelage he’s received from Colts veterans. That ‘child’ will look awfully big on Sunday when running down on kickoffs. “He’s got a lot of built up anger and frustration from practice. You can tell he wants to hit somebody but it’s practice and your teammates so you want to not do that,” Redding said of Adongo. Indianapolis Colts defensive end Cory Redding has been selected by his teammates as the recipient of the 2013 Ed Block Courage Award. The award is an annual recognition for courageous play by an individual and Redding is one of 32 National Football League players who earned the accolade. The players of each member club nominate an individual annually and those chosen are honored at a banquet in Baltimore each March. Redding is in his second season with the Colts and 11th overall in the NFL. In 10 games this season, he has posted 27 tackles (19 solo), 3.5 sacks, seven tackles for loss and one pass defensed. Redding, has appeared in 155 games, making 125 starts over his 11-year career. He holds career totals of 480 tackles (323 solo), 31.0 sacks, 20 passes defensed, 10 fumble recoveries, four forced fumbles and one interception. Since joining the Colts in 2012, he has started all 24 games he’s played in and has recorded 73 tackles (44 solo), 5.5 sacks, eight passes defensed and one fumble recovery. Off the field, Redding lends his support to many charitable endeavors. In 2007, he started the Cory Redding Foundation to support educational, recreational and community assistance programs for at-risk populations. The foundation’s current programs include the 3D Football Camp, the Cory Redding Middle School Challenge program and a partnership with Meals and Wheels in Austin, TX which provides meals for more than 2,000 individuals each year. Redding has also been involved with several other community events, including the CHUCKSTRONG Gala, Playground Build, Play 60 Challenge Launch Party and the Million Meal Marathon. Past winners of the award dating back to 2000, include: S-Antoine Bethea (2012), DE-Robert Mathis (2011), DE-Dwight Freeney (2010), DB-Marlin Jackson (2009), C-Jeff Saturday (2008), OG-Ryan Lilja (2007), WR-Reggie Wayne (2006), LB-Cato June (2005), LB-Gary Brackett (2004), DE-Chad Bratzke (2003), LB-Rob Morris (2002), QB-Peyton Manning (2001) and DT-Bernard Whittington (2000). The 36th annual Ed Block Courage Award dinner is schedule during March in Baltimore. Proceeds from the affair benefit the Ed Block Courage Award Foundation in Baltimore. The Ed Block Courage Award Foundation’s objective is to establish homes for abused children in each NFL city. Indianapolis established an Ed Block Courage home (Children’s Bureau) in October of 2000. The home is part of a national support network for abused children.